Washington, D.C. - Oct. 29, 2018 - M. Michael Meller of Gallagher/Meller Sport Horses was proud to present the second annual "Doc Spirit" Award during the Washington International Horse Show in Washington, D.C. to Eddie Blue, a 9-year-old Dutch Warmblood gelding owned by LL Show Jumpers LLC and shown by World Equestrian Games gold medalist Devin Ryan. M. Michael Meller presenting Devin Ryan's Eddie Blue with the second annual "Doc Spirit" Award. The "Doc Spirit" Award is presented annually in honor of the late Dr. John R. Steele to the horse that best exemplifies the heart and athleticism necessary to be competitive at the highest levels of show jumping. Dr. Steele, lovingly referred to by many as "Doc," passed away last year at the age of 91. He was a pioneer in top-level sport horse medicine and boasted a renowned career as an acclaimed equine veterinarian. The purpose of this award is to recognize his tireless dedication, passion and countless contributions to the sport and his love for horses. Ryan, of Long Valley, New Jersey, was honored to find out that his partner would be receiving such a prestigious award. The pair propelled themselves onto the world-stage of show jumping after they qualified and earned themselves a spot on the American team for the 2018 FEI World Cup™ Finals in Paris, France in April. There, the talented pair executed flawless rounds and ultimately finished in second place behind teammates Beezie Madden and Breitling LS, making their World Cup Finals debut an extremely memorable one. The pair would continue their streak of success by then earning a spot on the team for the World Equestrian Games (WEG) in Tryon, North Carolina in September, where they laid down excellent trips and ultimately had a team gold medal finish alongside teammates McLain Ward, Adrienne Sternlicht and Laura Kraut. "A horse like this stands out among the field of a lot of horses. As a rider, you always want these horses to have a little bit of history and maybe they will go down in history," Ryan said. "He's still a young horse. Hopefully, he goes on to do a lot more, but it's nice for him at a young age to already be recognized and that he is becoming a part of history. He did the WEG team this year, so that was pretty cool. He was the youngest horse at the WEG this year. To be able to have one of those horses, it's special, and I hope I have another one." Dr. Steele's longtime friend Missy Clark accompanied Meller during the presentation in front of a packed crowd in the Capital One Arena prior to the start of the evening's highlight class, the $135,000 Longines FEI Jumping World Cup™ Washington, where Ryan and Eddie Blue finished in eighth place. "Eddie Blue is an incredible horse who has showcased the talent to be world-class competitor from a very young age," expressed Meller. "This has been a truly breakout year for this combination and they have showcased their amazing partnership at the world's biggest competitions, and Eddie Blue is a horse that I know Dr. Steele would truly admire." 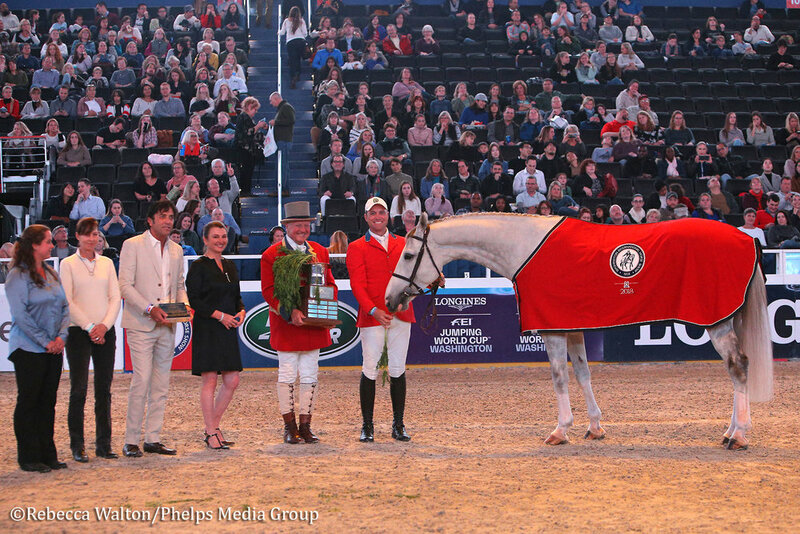 Meller will take center stage once again to present the M. Michael Meller Style Award at the 2018 CP National Horse Show in Lexington, Kentucky on Saturday, November 3 prior to the evening's highlight event, the $250,000 Longines FEI Jumping World Cup™ Lexington CSI4*-W. The M. Michael Meller Style Award is presented each year to the international equestrian who exemplifies the best style of riding along with maintaining a sportsmanlike composure. Last year's winner was Laura Kraut, of Wellington, Florida. To learn more about the "Doc Spirit" Award and Gallagher/Meller Sport Horses, please visit www.gallaghermeller.com.